Science: Fiction, Reality, or Both? But this statement was made over 30 years ago, before we had the modern computers of today, and now everything from our cell phones to toys are computerized. Today we use machines and computers and robots in a very wide range of fields and jobs. For example, welding robots are used a lot in factories which build larger machines, like cars. Robots are also being used to perform heart surgery. These robots are controlled by surgeons but use modern technology to perform the surgery faster and safer for both the patient and doctor. You can watch this video about performing heart surgery with a catheter robot to correct irregular heartbeats. These types of robots help to realize the past 100 years of ideas in science fiction. Isaac Asimov also wrote about characters like Andrew Martin, the Bicentennial Man, who started as a robot, but gradually built himself into a human, and R. Daneel Olivaw (where the R stands for Robot) who started as a mix of robot and human who could replace his parts and essentially live forever. While living forever is still outside our medical technology, progress with biomedical devices and artificial limbs and organs is being made every day. For example, my dad is a walking experiment! About 15 years ago my father had a hip replacement surgery because the bone on the crown of his hip died. This is very unusual and the doctors still do not know exactly what caused it. There was no way to regrow or replace the bone with other bone so they put in an artificial metal hip. The procedure is very interesting, but also very hard on the body. They said he may have to have surgery again in 10 years, but the procedure was so new they just weren’t sure. It’s been 15 years and his hip is still fine so the doctors have told him to keep using it until there are problems. X-rays showing the before (right) and after (left) of a total hip replacement surgery. And this is what I love best about combining science fiction and real life. In science fiction you can make up any technology you want or use real science in a fictional way. Both of these methods can contribute to new science and technology down the road once we have a better understanding of the world around us. So let me tell you a little about myself to explain how science fiction and science have inspired me. I am an undergraduate at OSU majoring in Engineering Physics. I’ve also studied biomedical engineering and I love anything which combines the fields of physics, biology, chemistry, and technology. I hope to graduate in a year or so and continue on to graduate school in physics or perhaps find a job in industry which focuses on a cool project. I have never built a robot, but right now I am doing undergraduate research working on a biosensor. For this project my team first makes a device which looks sort of like a computer chip but is actually a lot of tiny circuits. Then I add protein receptors to part of each circuit. These receptors then measure if a certain protein is there or not and this can be used to determine if people have a disease or not. The picture below shows the device about half way through the fabrication method, which also largely takes place in a cleanroom (for more details see What is Clean? By Megan Harberts). 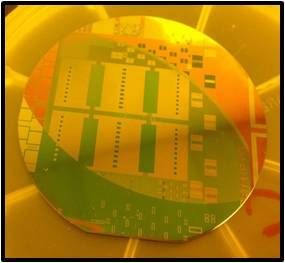 Silicon wafer with sensors half way to completion. This device can hopefully be used to test for a very wide range of diseases and conditions by using the protein receptor you want for whatever protein or other biological signal you are trying to measure. The device can actually work like a nerve, so someday a more advanced version could be used to repair nerve and spinal cord injuries. Imagining the science fiction applications, I hope to someday use this technology to create Asimov’s positronic brain, an artificial and programmable brain for robots. An inside look at the circuitry of the Star Trek character Data. So how does all of this translate to my daily life? My degree plan requires me to take a class which is actually a yearlong experiment we chose and design. My group’s project centered on creating a concussion detector we could fit into a football helmet. This project was definitely inspired by my interest in using technology to help with medical conditions. This project required me to work with physics, engineering, and programming to build a device which successfully measured how hard a player is hit while playing football. My biosensor project is also similarly inspired by once fictional, now factual uses of science. Other examples of technology created by a writer and eventually discovered by scientists include cell phones, optical tweezers, artificial limbs, digital billboards, space travel, and tablets to name just a few. Although it’s called “science fiction,” I think it could be renamed to “science we just don’t know yet.” For anyone interested there are robot building competitions for all ages. Science fiction has inspired me to become a scientist, and work on projects which use many areas of science to improve life for people (and robots). I am a senior in Engineering Physics. My husband Anthony and I are both in the Army. 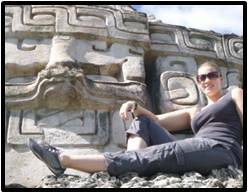 Together we like to travel around the world to see historical and cultural sites (like the Mayan ruins in Belize in the picture). I think it is very important to get young people involved in the sciences and work with several student organizations to accomplish this. My hobbies include reading science fiction, running, hiking, and snorkeling. I also love NPR, music, Great Danes, opera, and purple.